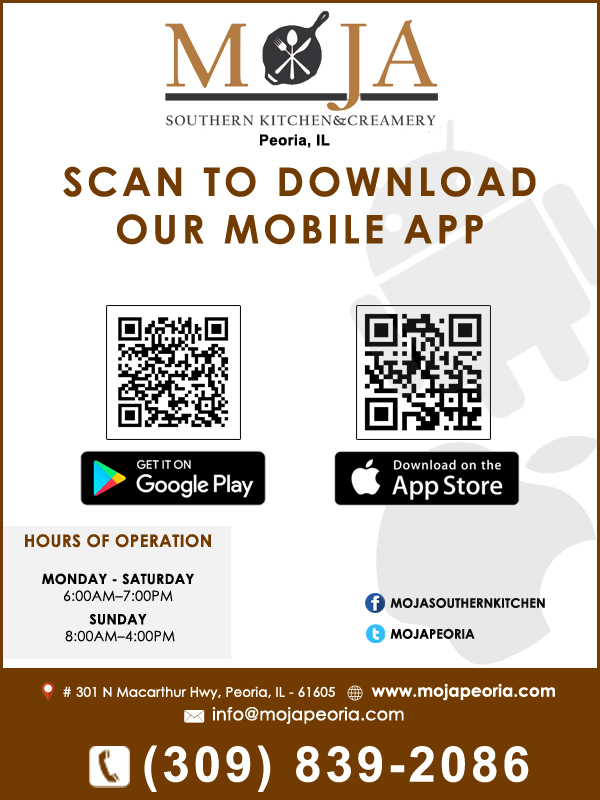 PEORIA — It’s been pleasant to see Moja Southern Kitchen take root on the city’s near south side and see the buzz spread by word of mouth and social media about the eatery. It’s an area sadly underserved by sit-down joints, and this is the beginning of the cure — in more ways than simply by offering excellent food. Owners at the restaurant at 301 N. MacArthur Highway have partnered with nearby Bradley University students on projects for neighborhood stability and community health — supporting the renovation of a vacant lot next door into a pocket park, and holding a fair on healthy eating. Though you might find many entrees here fried or grilled, there are plenty of choices on the side dish that offer a serving of vegetables with plenty of flavor. On a recent Saturday at lunch, we were seated promptly in the wood-heavy dining room that displays photos of Peoria personalities and other famous folks on the wall. We chose one of the window tables with a view out onto John Gwynn Jr. Park across the street. Our server brought us glasses of iced tea ($2), which you can get sweet — and, yes, it absolutely is appropriately sugared — or unsweetened. As she tended patiently to a nearby family with some precocious kids, we perused the lunch offerings. Those same youthful antics kept us amused during the brief wait for our meal. 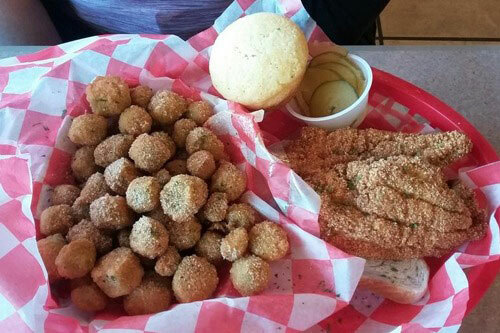 My guest had the fried catfish fillet ($4.25), coated in a flavorful cornmeal breading, alongside an enormous order of well-seasoned fried okra ($3). If the breading isn’t tasty enough on its own, there’s hot sauce table-side that you can add on. From a prior visit with friends, we knew to try the pork chop ($4.50), but rather than fried or smothered we had it simply grilled. It was juicy and bursting with flavor from the seasoning salt and herbs on it. Alongside, we got orders of candied yams ($3), sweet and with a smooth texture, and sauteed cabbage greens ($3), which gave a touch of savory to the meal. Both entrees also came with a sweet cornbread muffin. On that previous stop, we also can say good things about the ribs — only available from Friday through Sunday — which are hulking even for a four-bone ($6) or six-bone ($9) option. 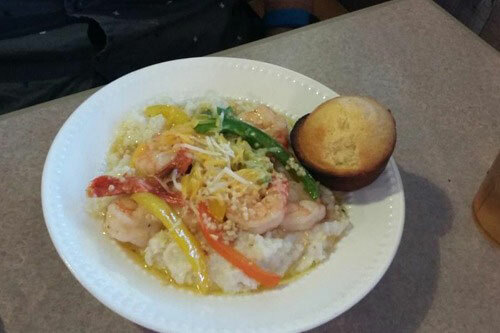 The shrimp and grits ($10.50) pairs creamy, cheesy grits with grilled, tail-on shrimp, peppers and some added cheese, and is great comfort food on a cold day. For those who like, there’s also a pretty sizable breakfast menu in the mornings, including a variety of biscuit-and-meat and English muffin-and-meat sandwiches, omelettes, as well as a few choices including grits and several additional versions of “and waffle” breakfasts (fried chicken and waffle, fried catfish and waffle, fried pork chop and waffle) that are also available throughout the day. Right now, desserts are limited, but the peach cobbler ($4) is a sweet, soupy, cinnamon-spiced serving dish of goodness. The restaurant also plans to boast an “and Creamery” addition to its name, with the north side of the restaurant still under some tweaking to offer ice cream treats as the weather warms. That should draw even more visitors in. And do not let the demolition and reconstruction of the MacArthur bridge discourage you; the detour added perhaps an extra minute to our travel time. That’s time worth spending to get a bite here. 1st Annual Moja Easter Egg Hunt. Sausage and Pancake Breakfast is served from 8 AM to Noon. Breakfast fee is $5 per person for breakfast. This is no fee to participate in the Easter Egg Hunts located on the property at Moja Southern Kitchen. Join us every Wednesday for 50 cent Wings! IncludesTraditional and Boneless. Extra sauce $1. Dads and Moms enjoy a special night out with dinner, fun activities and dancing with your child. $20 for 2. $5 each additional child. $10 each additional adult. Choice of Dinner includes Burger, Chicken Nuggets, Hotdog, Fish Fillet, or 2-Piece Chicken. Choice of Fries or Chips. Beverage included as well. Drawings will be held. Dads have a chance to win a Television. Moms have a chance to win a Spa Package. Pre-pay at Moja Southern Kitchen. Limited to first 100 Attendees. Lil Miss and Mr. Moja will be selected. Also Best Dressed Awards will be given. Come enjoy the fun and have an unforgettable night out! Thank you for being patient with us while we work towards giving you the Best Experience of MOJA's. We are officially opened for business today 06/14/2017. 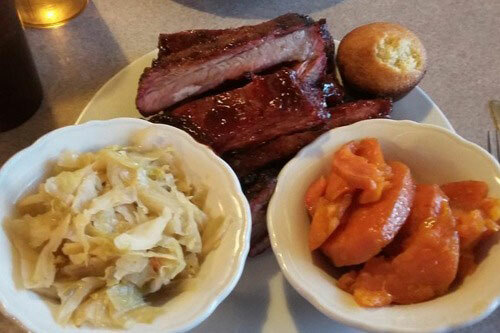 Please come join us for tasting the culinary passion in Southern Cuisine.